Need some advice from the pro’s here. I bought a used dauntless thats suppose to be in great shape. 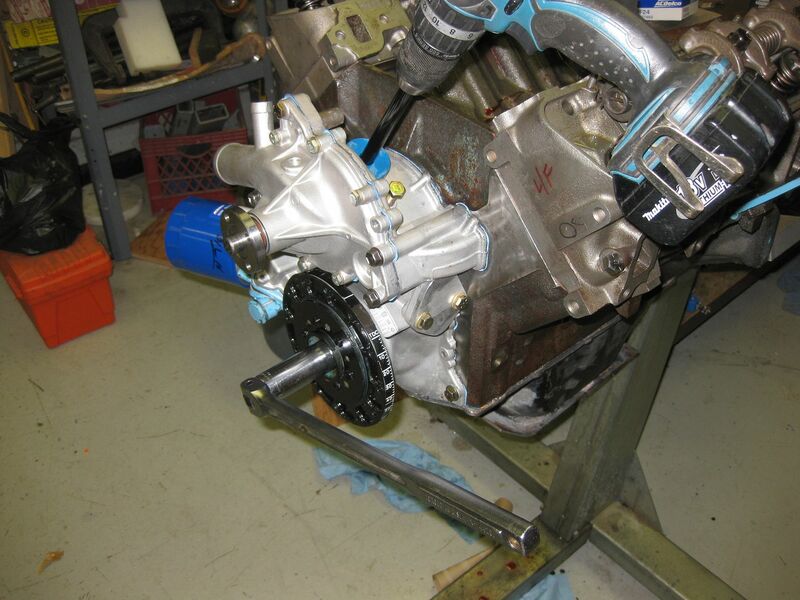 I installed it and with the distributor removed, i tried priming the oil pump. The oil dipstick checks out fine but after a whole night i still was getting nothing on the pressure gauge and no oil flow in valve covers. Infact i pulled the oil filter off and it was dry as a bone. So i pulled the oil pump cover off and packed it with vaseline. Now i get around 60-70 psi oil pressure. Which is a little scary to me. The oil filter is full. I still havnt seen any oil flowing around in the valve covers. Should i just go ahead and fire this thing or am i set up for disaster? Thanks in advance! Now i get around 60-70 psi oil pressure. I would check that the oil pressure-relief valve is clean and free. I once mounted a NOS oil pump, and blew the oil filter right off the engine because the relief was gummed closed with old cosmoline. As for the rockers, have you tried cranking the engine for a while with the coil disconnected? Rick Whitson and Rich M. like this. I'm for sure not a pro, but if it was mine, I would turn it manually with a ratchet. Just to see if it would put any oil up top. Might need to move the lifters a little. Hellion, Tom_Hartz and Bowbender like this. You won't see much at the rockers. see post 16 below for better description. On a 225, does not the oil pump run off of the bottom of the distributor? I think it does. Supposedly it's the same oil priming setup as a Chevy V8. You remove the distributor and put the tool in the distributor hole, then spin it with your electric drill. Walla, oil pressure. Posts about this say you will see oil coming out at the rockers, once everything is primed. You should also see an indication of oil pressure on a mechanical OP gauge. That was not "start up" with the engine running, and it should not be that high. Time to ask yourself why. For instance, what if a main oil gallery is blocked? That's not normal. You should see oil at the heads. Any number of things could be wrong. On the 225 only the front rocker tower has the oil journal for the rocker shaft and it also has to have the special shank bolt to allow the oil to pass by. Also the rocker shaft has to be correctly installed. Only one way is the right way. 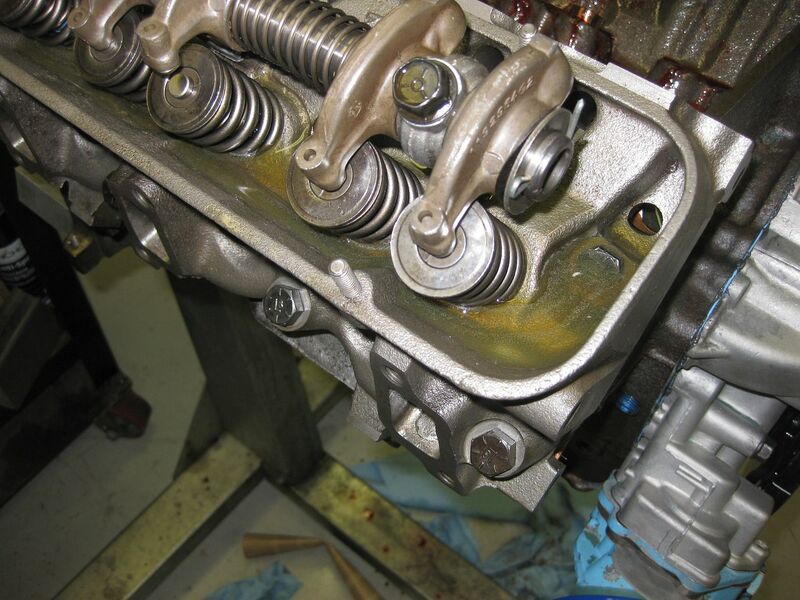 The rear of the left bank has the shaft alignment notch pointing out away from the engine and the right rocker assy shaft will have the alignment notch at the front and pointing out away from the engine. Here are some pictures that may help. Glad to see this as it clears up a lot of miss-conceptions. Going through the same thing right now and I wondered the same thing. Very little oil in the head so I pulled my rockers and turned the oil pump with drill attachment. The front galleys that exit into the front rocker mount were gummed up and when I took the rocker off and used the drill it decided to let loose; blew it's wad so to speak. You can stick a long piece of Aluminum welding rod down in the galley pretty far if it's really gummed up. Having gone through this already, I would clean your lifters and work the valves loose while your at it or you may end up with some bent push rods. If you decide to go that route, I would leave the lifters empty after you take apart and clean. When you install the rockers then pump them up with the drill attachment. Also wouldn't hurt to add some engine flush to your oil while you're pressurizing the system. I used some Lucas and MMO and my oil turned black after the galleys started clearing out. You can also pull the front two lifters out and do the same thing to clean those galleys out. Sounds like your engine is full of old oil and varnish so I would do all the above and maybe drop the pan also. If it's just from sitting many years and not actually worn out you can save it.